So, today I set out to play with the new Stampin' Up! exclusive Matchbox Die. I had pre-ordered it a couple of weeks ago but between club projects, yard work, and a weekend trip I just hadn't had time to play! I have a few birthdays coming up and decided I wanted to do a little something for them. Who doesn't like getting chocolate on their birthday?? So, I made the box, filled it with some Hershey's nuggets and made a matching card. What I love is that it was so easy to do!! I made a collage of the box closed, open, with the card, and the card alone. All products except chocolates (and why doesn't SU sell chocolate?) from Stampin' Up! I have to admit the Pink Flamingo DSP is WAY wilder than anything I'd normally use but a couple of my friends having birthdays soon LOVE these bright colors so I think they will enjoy the things I make for them with this paper. 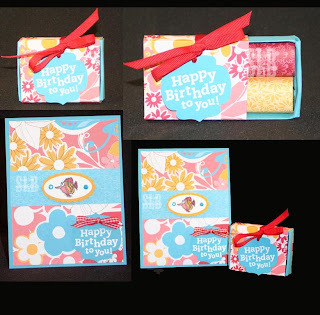 Matchbox Exclusive die, Just Beachy stamp set, and Scallop Oval punch will be available for order beginning April 1st!! Very fun! I love this paper with this set! That is really fun Sharon. So cheerful and bright. Oh, man. Not only am I going to *need* that die now, but I had talked myself out of that DSP and now I *need* that too! Now I know what to order for the April promotion! The matchbox die and the cute "Happy birthday" stamp. I love the projects and the bright colors! Fantastic. One more thing to put on my to do list. Oh, this is darling, Sharon! And I love that paper!